Oh, time travel, you and I have a complicated relationship. I always want every book about you; your appeal is irresistible. Each time, I’m sure that this book and I will fall in love and run away together into many different sunsets in a variety of eras. So often, though, the book in I, we don’t see eye to eye. The book says the universe works one way, and I cannot suspend disbelief. All Our Yesterdays is one of those instances. That said, All Our Yesterdays is also a really impressive debut with solid writing, intriguing characters, and a deliciously dark plot. Terrill tells this complex time-bending story through two first person perspectives, Em and Marina. The two girls could not be more disparate. Em is hard and desperate to save the world. Locked in a prison with only Finn, her friend in the neighboring cell to talk to, she schemes her escape so that she can travel back in time and save the world from an evil dictator. Marina meanwhile has more average teenage concerns: friends, appearances, and a boy. Marina is selfish and vain. These perspectives are brilliantly done, even Marina’s though I was not a fan of her. My favorite aspect of the novel is the relationship dynamics. Marina and Finn have a connection forged over years, specifically the same set of years over and over. They’ve had to watch one another be tortured and been separated by the wall of a prison. Though technically still fairly young, they’re aged and matured by their experiences, ones such as no person should ever have to go through. Hardened and prepared to kill, they have this intense and touching love. Even more delightful is that, though their love feels real, they do not put that first, and are ready to say goodbye to one another to save the world. They both put survival first and love second. Marina, on the other hand, has romance foremost in her mind. She’s been in love with her best friend for ages now, still amazed that he turned into such a hottie and grateful that, in so doing, he raised her social status at school. Unfortunately, he treats her like a kid, both because he’s slightly older and a genius who graduated early and is off at college being brilliant. When he comes home to visit, she can’t make much progress because James’ other friend is always there like one big, obnoxious cockblock. Of course, the friend has an obvious crush on her, well, obvious to me but not to Marina. Both guys are fantastic, and, frankly, Marina does not deserve them, though she is young and may learn. Terrill really does some surprising and daring things with her plotting, and I loved that too. Where a lot of YA novels really wimp out on the villains, this one is epic and terrifying. At several points, I was surprised by what happened, even in ways not surrounding the resolution, with which I took some issue. The plot is dark and intricate, and kept me constantly curious to know where the story would go. However, the time travel elements all depend on whether you can accept her time travel theory which suggests that time will take care of a paradox. Personally, I don’t. It’s all just too convenient, and really doesn’t make sense to me. In the end, I’m left feeling like that convenience took what should have been a devastatingly heartbreaking ending of amazing into a sad but hopeful ending. That will work for some readers, but for me was frustrating. Now, I’ve always been completely awful at science, so it may be that Terrill’s explanations make perfect sense, but they don’t to me and that’s all there is to it for my personal reading experience. The plot of All Our Yesterdays is full of drama, action and will make you scratch your head more than once. I loved how dark and thrilling the story was. Assassinations, chases, fights, kissing all combine to make All Our Yesterdays an edge of your seat read. For readers who are less particular about time travel mechanics, All Our Yesterdays is a must read. 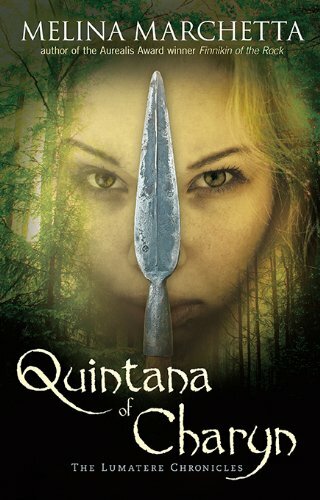 The next Sadie Hawkins Sunday book will be Quintana of Charyn by Melina Marchetta, and then I’ll be done with that series and moving on to finish the Mistborn trilogy in my SHS sequels. WOO! Want to tell me what to read? Fill out the form on this post. I just finished the second Mistborn book. The feels! I just finished reading this as well, and have a very similar relationship with time travel – I want to love it, but the paradoxes kill it for me. This book, though, I found I could kind of accept her explanation for why the paradoxes wouldn’t be an issue because I have to keep reminding myself that we don’t actually know how time travel would work, and as long as the author addresses the issue of paradoxes, I kind suspend my disbelief enough to just go along with what they say. To me, it’s kind of like whether or not vampires can go out in the daylight. I can’t believe I just compared vampires and time travel. I just mean because I’m not science-minded and I don’t know anything about the actual science of time travel, I can accept Terrill explaining away the paradoxes. I’m worried none of this makes sense so I’ll stop now and just say I’m glad you didn’t hate it. I totally understand your struggles, but I’m happy you agree that this is a solid debut! Marina’s vanity and selfish concerns annoyed me too, but the sad thing is I know a lot of girls like her so Terill definitely covered that front well. I heard QUINTANA was the best in that series, so I’m curious to see what you think about that next weekend! Although I enjoyed this a little more than you did, I do agree that some of the scientific explanations felt a fraction too convenient. Mostly, I was impressed, but I thought that the mention of a possible sentient element that eliminated the threat of paradoxes and unfixed events was a little too vague. Other than that though, I really loved this book, and I’m glad to see that you mostly enjoyed it too. 🙂 Great review! HMMMM very interested to see what I think about this one. I want to love all the time travel books, as well. I haven’t quite met one yet I didn’t love, but sometimes all the science, once you start thinking about it, can definitely get overwhelming – or like this one for you, sort of dodgy. I’m curious about how the author handles paradoxes and everything. Will look forward to reading it and seeing if I react as you did, or differently. I did like this book very much! Cristin Terrill’s writing was absolutely gripping but you’re right, All Our Yesterdays wouldn’t be so suited to someone who is very particular about the details of time travel. I really have no knowledge in that area so it was fine for me. Hopefully I don’t take a class in time travelling otherwise I’d be screwed? But I really can’t wait for her sequel! FINN.